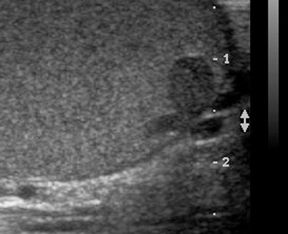 Patient A: Real-time, gray-scale ultrasonography demonstrated testes that were symmetric in size and homogenous in echotexture.Dilated tubular hypoechoic structures were noted coursing through the left testicle (Figure 1). 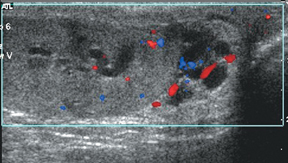 One had a more oval shape (Figure 2).Color Doppler demonstrated that these were indeed vascular lesions with a venous waveform upon spectral analysis. Dilated tubular extratesticular vessels were also identified in the left hemiscrotum. Patient B: Real-time, gray-scale imaging demonstrated a smaller atrophic left testis. Incidental note was made of an intratesticular mass on the right. Dilated tubular hypoechoic structures were noted in the left testis (Figure 3). An increase in venous flow was noted in these vessels during a Valsalva maneuver, as well as in the ipsilateral varicocele (Figure 4). Though extratesticular varicocele is a common condition, occurring in approximately 15% of men, an intratesticular varicocele (ITV) is a rare entity. It was first described in 1992 by Weiss et al1 and has since been noted in about 60 case reports. Two of the largest studies have shown a prevalence of 1.2% to 2% in symptomatic men referred for sonography.2,3 It is, therefore, an incompletely understood condition. We present two case reports from our institution with some similarities and differences when compared with what is known about ITV. Sonographic findings include multiple hypoechoic, serpiginous, and tubular intratesticular structures of various sizes with low-levelinternal echoes. Doppler demonstrates a low-flow venous pattern. It was first considered always to be associated with an ipsilateral varicocele. Das et al2 showed that 44% were associated with an ipsilateral varicocele while Kessler et al.3 showed this association to be 86%. Though mostly found in the left testis, bilateralism has been shown in 25% 3 to 39% of cases.2 Both of our cases are on the left and coexist with an extratesticular varicocele. They are subcapsular in 60% and confined to the mediastinum in 40%.3 Das et al2 were the first to describe a variation in the usual tubular shape, an oval varicocele, which we also demonstrate in patient A. The tubular-shaped lesions are less of a diagnostic challenge. The oval lesions must be differentiated from an intratesticular mass. The differential diagnosis includes a cyst, abscess, hematoma, tubular ectasia, cystic neoplasm, or a psuedoaneursym.4 Color Doppler can be helpful. Das et al.found that 28% of the lesions required power Doppler and/or a valsalva maneuver to make the diagnosis of ITV.2 Kessler et al found a greater need for adjunctive imaging techniques in 40% of their patients.3 Color Doppler was sufficient for the diagnosis in our patients, though Valsalva helped. Ho et al described a patient with a 44% reduction in testicular volume over a 2-year follow-up in a patient with an ITV and ETV.5 Patient B demonstrates a loss in volume in the testis with the ITV relative to the contralateral testis. However, it is unclear whether the volume loss is related to a prior hematoma evacuation. We present two patients with the rare entity of intratesticular varicocele. Their imaging characteristics are described and compared to previously known cases. Awareness and description of more cases will help further elucidate the clinical significance of this entity. Weiss AJ, Kellman GM, Middleton WD, Kirkemo, A. Intratesticular varicocele: Sonographic findings in two patients. AJR Am J Roentgenol. 1992;158:1061–1063. Das KM, Prasad K, Szmigielski W, Noorani N. Intratesticular varicocele: Evaluation using conventional and Doppler sonography. AJR Am J Roentgenol. 1999;173:1079– 1083. Kessler A, Meirsdorf S, Graif M, et al. Intratesticular varicocele: Grayscale and color Doppler sonographic appearance. J Ultrasound Med. 2005;24:1711–1716. Dogra VS, Gottlieb RH, Rubens DJ, Liao, L. Benign intratesticular cystic lesions: US features. Radiographics. 2001; 21:S273–S281. Ho K, Mcateer E, and Young M. Loss of testicular volume associated with intratesticular varicocele. Int J Urol. 2005;12:422–423.